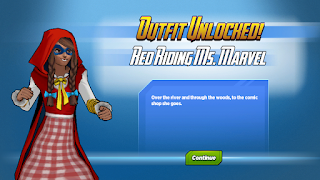 Red Riding Ms. Marvel is an outfit that you can win for Ms. Marvel in the Ultimate Halloween Crate at a cost of 75 Shards per try. 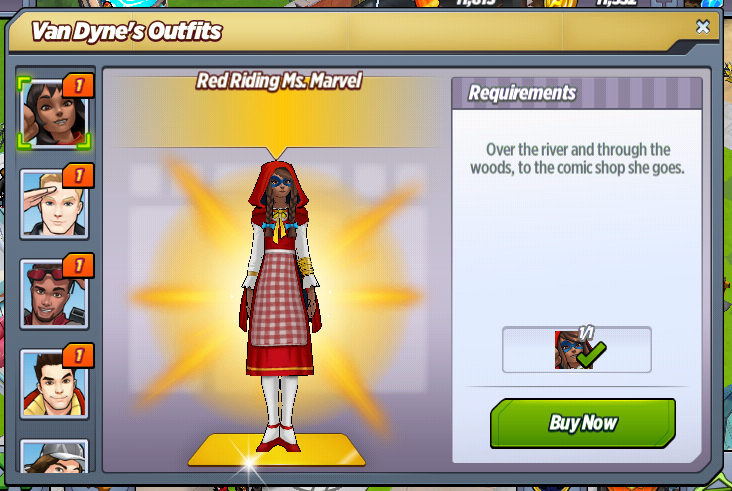 After winning her, you'll just need to equip the outfit in Van Dyne's. 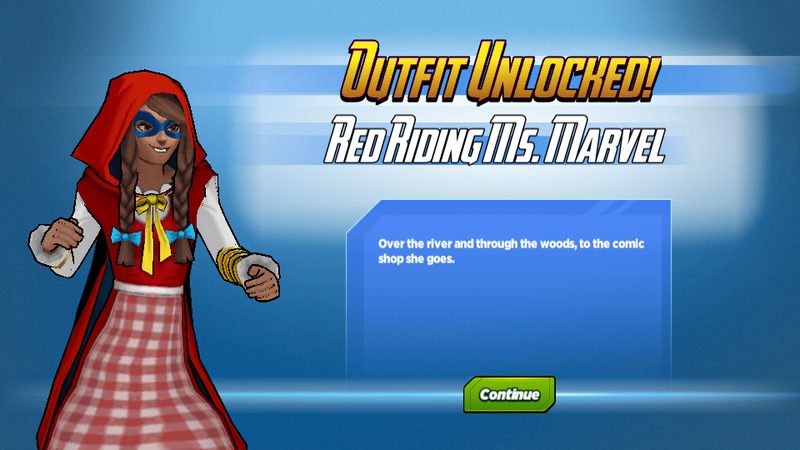 The outfit has a unique questline and allows Ms. Marvel to take part in Hangouts! Red Riding Ms. Marvel: Do you think my costume is too childish? Wasp: No way! If anyone tells you that, you should kick 'em in the face. Wasp: It'll happen one day. You just have to believe in yourself, and kick a bunch of people in the face. Wasp: See?! Everyone loves your costume! Red Riding Ms. Marvel: Thanks. I feel way better. I'm just gonna go enjoy everything about Halloween at Avengers Academy! Wasp: Don't let the demonic invasion ruin your good time! Cap-Wolf: I'm just kid from Brooklyn. Red Riding Ms. Marvel: ...And a werewolf? Cap-Wolf: That too. At least we make good pair. Red Riding Ms. Marvel: Let's take some pics! You won't eat me, right? Cap-Wolf: Of course not. Had big breakfast. Red Riding Ms. Marvel: What great pics you take! Cap-Wolf: Don't remember that story. Hard to think about anything but howling nowadays. Red Riding Ms. Marvel: Is there something I can do to help? Red Riding Ms. Marvel: I want to do something extra for Halloween. Penguin Falcon: Like Trick or Treating? Red Riding Ms. Marvel: I've been Trick or Treating, Falcon. Even my parents aren't that strict. Penguin Falcon: I don't know. All I ever do on Halloween is walk around and eat candy. Red Riding Ms. Marvel: What if we take the Quinjet around?! And eat ALL the candy?! Red Riding Ms. Marvel: So. Much. Candy. 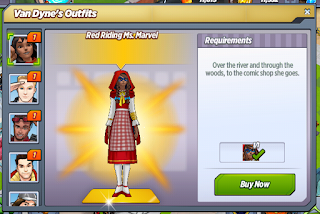 Red Riding Ms. Marvel: Totally worth it. Penguin Falcon: What if I'm really a penguin who's dressed like a person who's dressed like a penguin? What do you think of Red Riding Ms. Marvel? Did you try to get her from the mystery box? Do you think she's worth trying for?